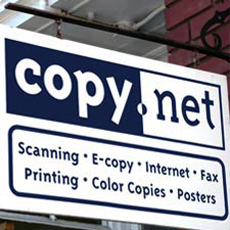 We opened in 1988 as a neighborhood copy center to provide services for local businesses. As projects have become more sophisticated we've continued to acquire more advanced technology to meet our customers' needs. We offer copying, digital and offset, thermography printing, large format posters, scanning, finishing, binding, fax, mail boxes. We also provide design services. Pick up and delivery within the city limits.